Last week Izzy posted some reflections on his time in hot and sunny Malaysia, just as the snow began to fall in Birmingham. So this week I thought that I would stick a bit closer to home, in both geographic and meteorological terms, and post some thoughts on my experiences in Lithuania… And a laba diena to all our Lithuanian readers! I have been fortunate to spend rather a lot of time in Lithuania (my partner is Lithuanian) in both the cities and countryside. To my mind, which admittedly is neither very broad nor deep, one of its defining characteristics is the presence of a lot of tower blocks. One of Lithuania’s defining characteristics that is, not my minds, though you could say that about me. Tower blocks and Birmingham’s suburbs. Told you it wasn’t very broad or deep. But I digress. I mean, there are others (home brew vodka, more trees than you could shake a stick at and fondness for all things pickled, again characteristics of Lithuania. Although…) but tower block living is definitely up there. There are a lot. 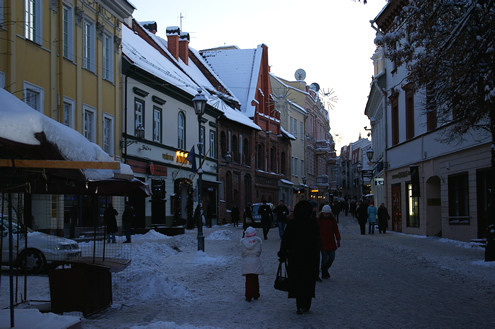 There are of course also beautiful 18th century streets in Vilnius (the capital city, see below), proud pre and post-soviet civic buildings and many more traditional square wooden houses with high pitched roofs but really, tower block living feels like the norm. And this isn’t just in the cities, but all over the country. I am sure that a large part of this is a legacy of Soviet times, when mass housing seems almost always vertical. I have read that Vilnius neighbourhoods were planned as “micro-districts” where tower block communities would be grouped with a shop and nursery schools. They would also have clear boundaries, which in Vilnius seems to be a highway or forest. In this way the city feels more like a Le Corbusier playground than a central European city that was first written about in 1323. At this point it might be worth listening to Will Selfs radio piece on planning in the UK available here. These blocks survive, in my opinion, because those Soviet builders could build solid structures. These are tough concrete buildings with very few embellishments. They had to be tough to cope with the weather; in Lithuania it can be -20c in the winter and above 30c in the summer. They also had to house a growing urban population. Vilnius more than doubled in size between 1959 and 1989. More than anything else they are functional. And I think they look kind of cool. 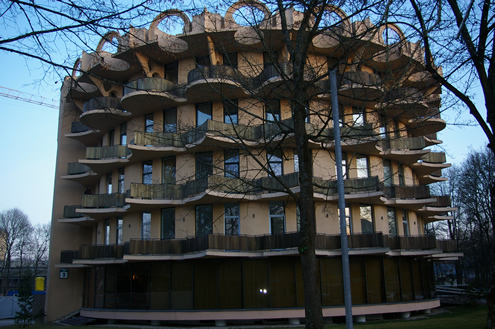 But if the exterior is a little Spartan (but please remember that not all Soviet era architecture is, and see the Hotel Pusynas in Druskininkai, built in 1982, below), the interiors are, well, just like the ones we have been to in Birmingham for this project. They have wide staircases, good sized rooms and of course, great views. I think the most significant differences with many UK flats are the widespread use of enclosed balconies and many of them appear to be duel aspect. Which not only adds to the views and general feeling of space, but also help with ventilation and light. I am told that after independence, houses became the property status symbol and remain so. In Vilnius, they are very expensive. And so tower block living remains the norm, young people expect to live in tower blocks, and when I see new housing being built it is another tower block. But this time they are different. They are huge, they are glitzy modern buildings, in the UK they would no doubt be described as aspirational and appeal to the young executive types that yearn for city centre living. But they are also, in my humble opinion, lacking something of previous years. They are identikit modern constructions and many contain smaller flats than the Soviet blocks. For me, they lack the character of previous blocks, though I must agree with Izzy that the lived experiences of the residents is rather more important than my aesthetic concerns. I’m afraid I can’t give you a great account or any recordings of those experiences, just a little flavour of the attitudes and feeling of high rise living in Lithuania. I don’t know if the blocks became the great social spaces described by Vanley and Dood, or have the basis for artistic inspiration. Nor can I tell you what it was like to move from rural Lithuania to the city in Soviet times. That is for another project. But what I can tell you is contrary to recent think tank pieces in the UK, these blocks, like ones here, do have a sense of community and neighbourhood. Hopefully one day we will get to record their stories too. If you would like to add your story of a tower block where you live, please don’t hesitate to contact us! Probably the main reason why the Soviet tower blocks still stand is because there is no other option. With 50%-60% of all city dwellers living there one couldn’t just replace them. Problems to live there are manyfold: in fact, Soviet construction was never of good quality as there was almost no incentive to do quality things in socialist economy. Moreover the Soviets had considerable gas reserves and did not care about ecology – therefore insulation is minimal in these buildings and heating prices skyrocketing (a small flat of 50 sq. m may cost up to 50% of average salary to heat in a single winter month and the heating is centralised meaning a person can not even choose to lower temperature to pay less, even if he would improve insulation at his own flat). The various programs for mass renovation of these buildings are therefore considered so important that they are deliberated in parliament and government but so far only a minority of buildings are renovated (renovation includes insulation, etc., but it is costly and there is always a problem that some inhabittants of each building does not want to pay). However you are right that many city dwellers would choose to live in apartments if they could (albeit non-Soviet built). 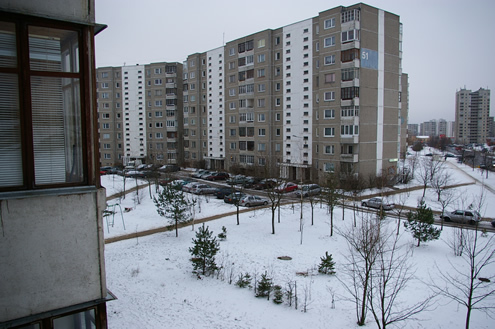 Terrace homes are very rare in Lithuania and their sheer number in UK is strange to us as much as these tower blocks in Lithuania are to you. Even the old towns consist of buildings full of apartments with public staircases (albeit these buildings are older, dating to 15th-19th centuries). Thanks for your comment and insight! Very helpful and a good counter to my more romantic view!